which are available in both formats namely, Word and PDF.It’s very simple and easy. You need to download the free examples, samples, fill them up and take the printouts and get started to hold back the foreclosure for some time and replay the borrowed amount.You can also see Sample Business Partnership Agreements. 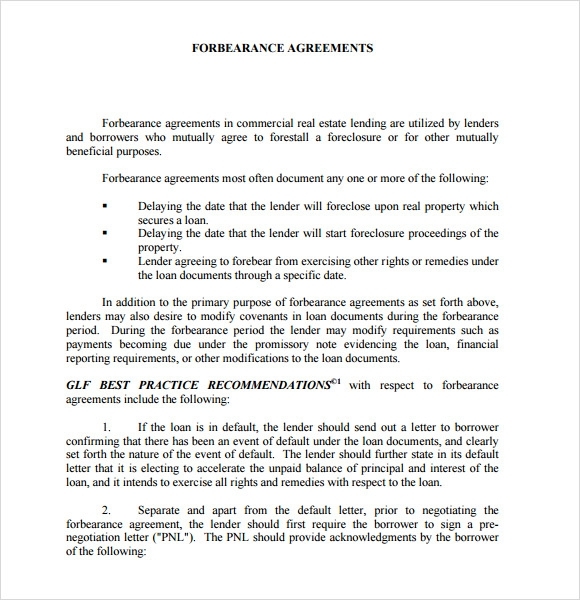 This sample of forbearance agreement, deals with various recommendations which are typically followed in the forbearance agreements. It includes a series of best practices recommendations which are related to warranties, defaults, communication and negotiations in a detailed manner. This sample of forbearance template is a very professional template, which comes with the logo, date and name of the company. The template begins with the borrower’s information, followed by the request forbearance. In this section the reason for forbearance is specified. The final section deals with the terms and conditions related to the forbearance request. 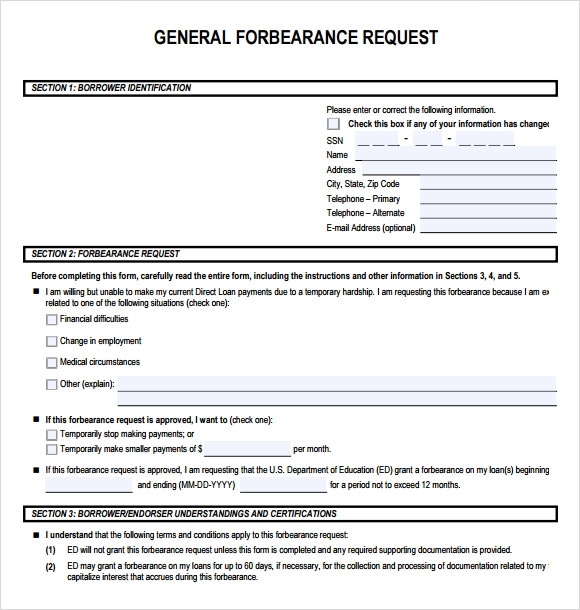 This sample of forbearance agreement, deals with a list of conditions which are related to the forbearance agreement. It contains all the details related to outstanding balance, current default, and request for forbearer, drop dead date, amendments to loan documents and conditions for forbearance. 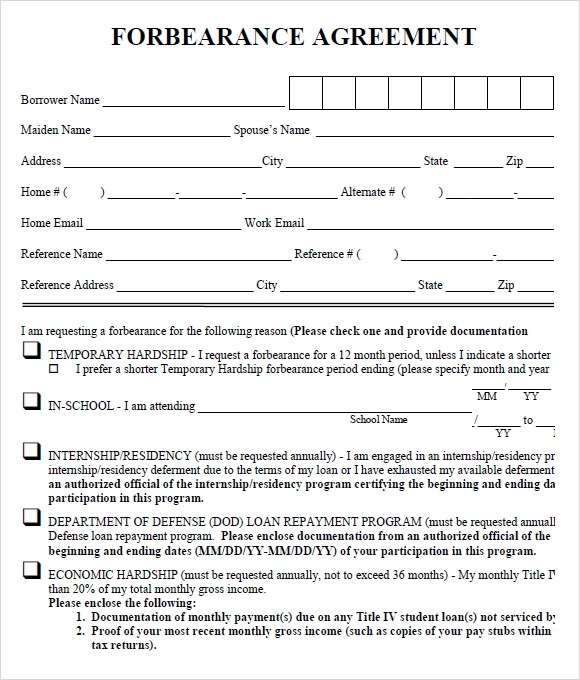 This sample of forbearance Agreement has a simple format, where the first section deals with the basic introduction of the concerned parties, followed by the date. 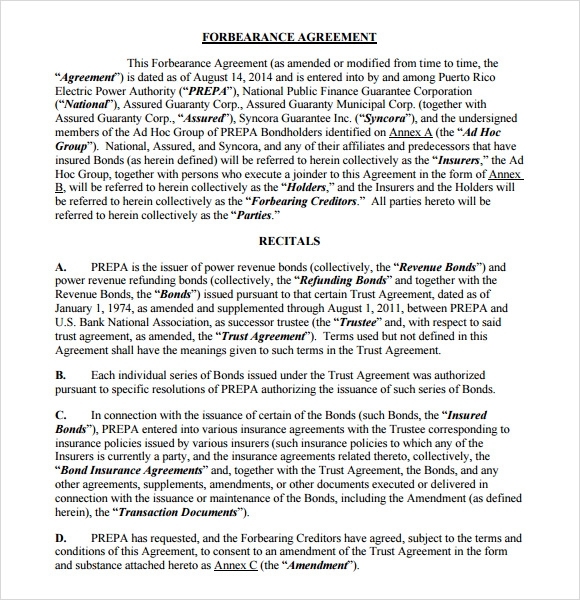 The second section deals with the recitals of the agreement, under various subsections. It is followed by forbearance terms and the conditions present along with the revival options. 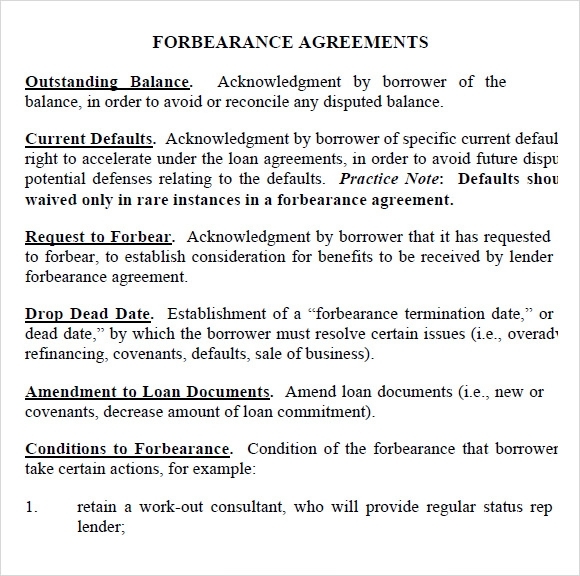 Forbearance agreements are typically signed between lenders and borrow in view of the fact that the borrower has some short term repaying problems. 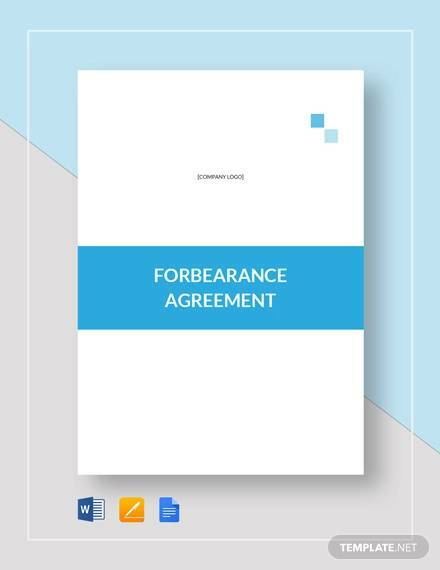 Forbearance agreements are not solely linked with mortgage loans; however it is one of the most common types of loans which require forbearance. Borrowers can qualify for forbearance as a result of illness, financial hardship, or by participating in certain government approved programs. What Are The Important Points of A Forbearance Agreement? A forbearance agreement is signed for a short period of time, not exceeding one year time period. Any defaults by the borrower are not waived by the lender during the forbearance period and he reserves the right to enforce all his rights for any breach of agreement. A forbearance fee is usually charged by the lender, which ranges from anywhere between 0.25% – 2%. 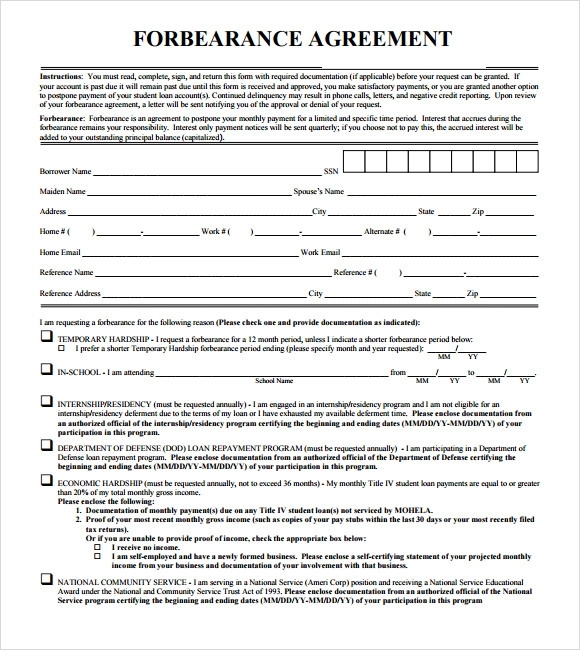 A forbearance agreement is often used by a lender to correct any deficiencies in the loan document. What Are The Advantages of A Forbearance Agreement? It saves a lender the pain of wasting time and money of taking enforcement action. It provides lenders the time to financial advisors to access in detail his financial position and develop an enforcement plan for the worse possible scenario. It allows the lender to amend the terms of existing facilities like the repayment interest rates. A forbearance agreement has a multitude of advantage for both the lender as well as for the borrower, however drafting the agreement is very critical for all such type of contracts. The examples given above would help you with a general idea about creating a draft for different circumstances.You can also see Sample Property Management Agreements.